Everyone's family photo album has faded pictures similar to this, with ladies like Lillian (in pink hat). Every snap has a story to tell if we can only discover it. Eric & Sandra did just that. 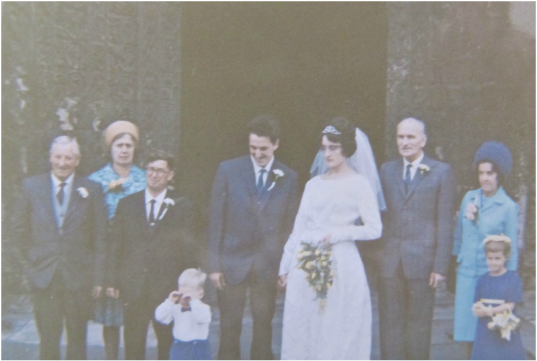 We were reading (and enjoying) Ken Oatley's fascinating story of his great-grandmother, Leah Priscilla Oatley, when we suddenly realised that one of her children was related to us. After a quick look in the family photo album we came up with certificates and photos of Sydney Wallace Waite Oatley, the third child of Leah. Sydney was born on 18 June 1882. 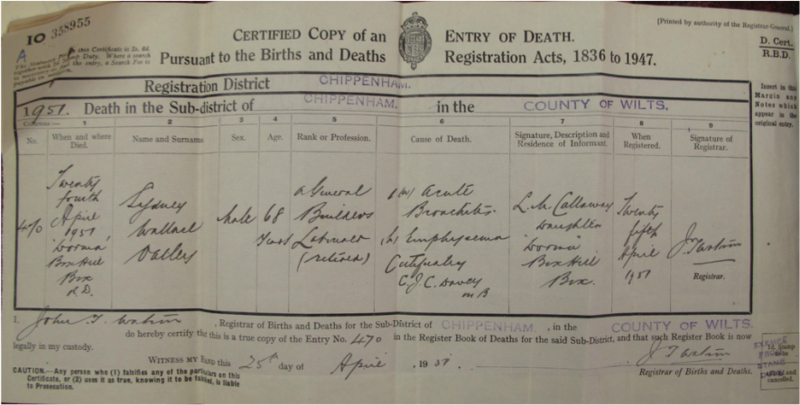 Some records say he was born at Chippenham Workhouse, but his birth certificate below says at Box Hill. 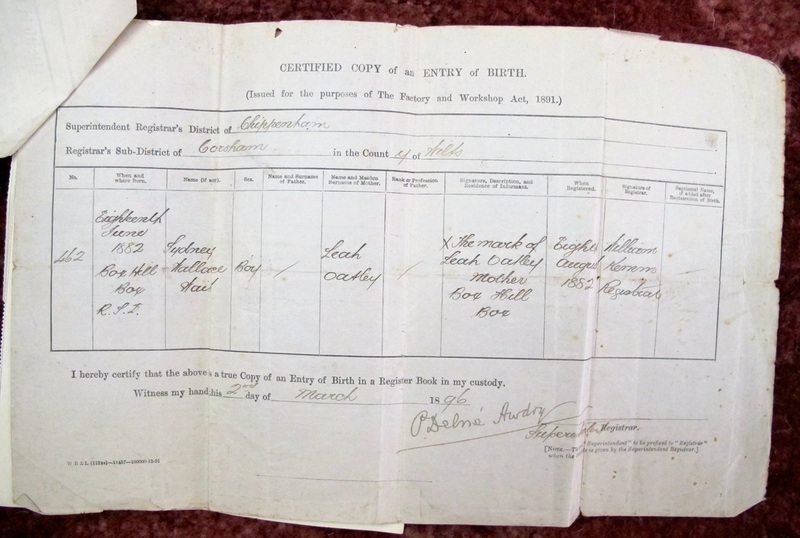 No father is recorded and his mother, Leah, made only her mark, being illiterate. By 1887 the Parochial List of the Indoor Poor shows that he was living with his mother and the rest of his family in the Workhouse. 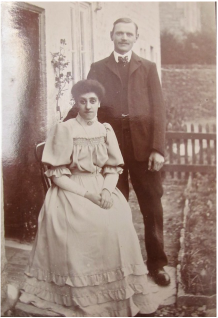 In September 1907, aged 25, Sydney married Lillian Hester Gleed of Yatton Keynell. He was working as a labourer; she was 24 years old and a housemaid. 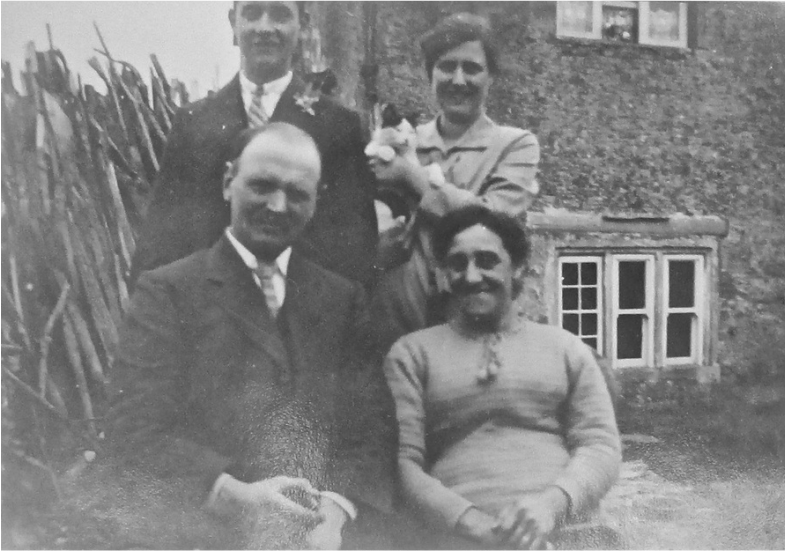 They lived at Ford and Yatton Keynell and Sydney continued his employment as a building labourer until old age forced him to retire. For a short while they lived at Dorma on Box Hill where they died. Sydney and Lillian Hester had two children who survived to adulthood: Lillian May Oatley (1910 - 1989) and Benjamin John Oatley (1909 - 1971). 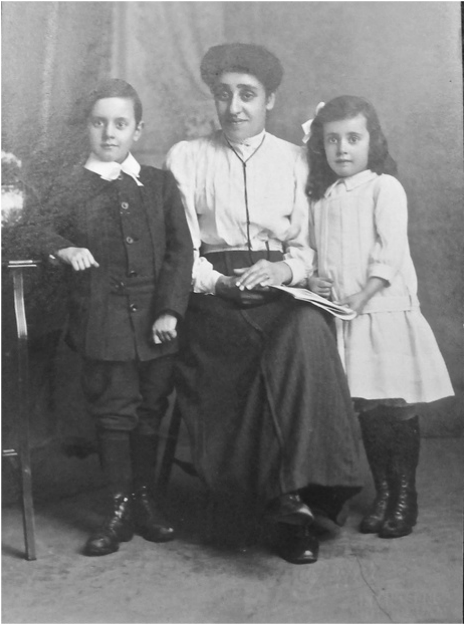 They are seen left in the late 1910s with their mother. The family remained close throughout their lives. Benjamin moved to the Gloucester area. Front Sydney and Lillian Hester. It was possibly taken in 1947 on the fortieth wedding anniversary of Sydney and Lillian Hester. Sydney died on 24 April 1951 in Box and Lillian Hester on 11 January 1952. They are both buried in Box Cemetery. Our interest in this story is through Sydney and Lillian Hester's eldest child, Lillian May, who married Edward (Eddie) Callaway, Eric's father, in 1936.